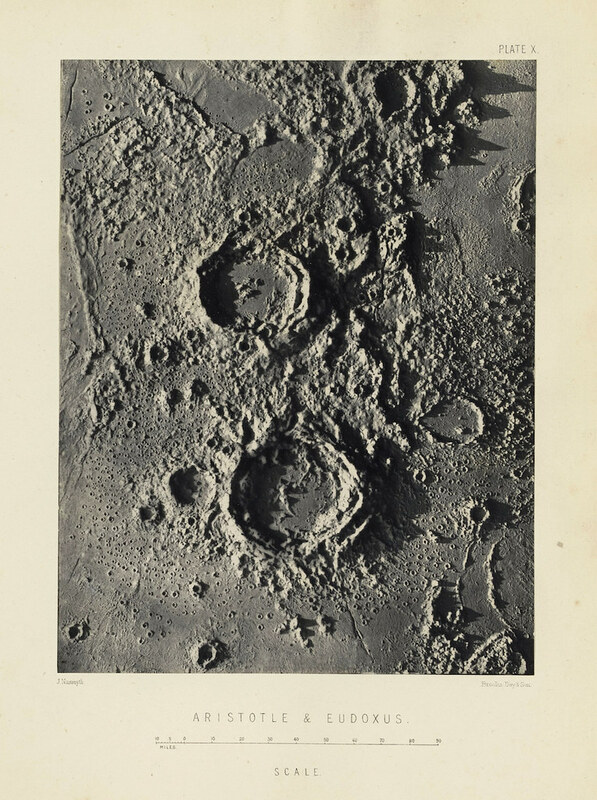 At first glance these intricate depictions of the moon might seem like photographs from the Apollo space program of 1961–75. In fact they were captured a century earlier by an ingenious and wholly land-based Scottish astronomer. 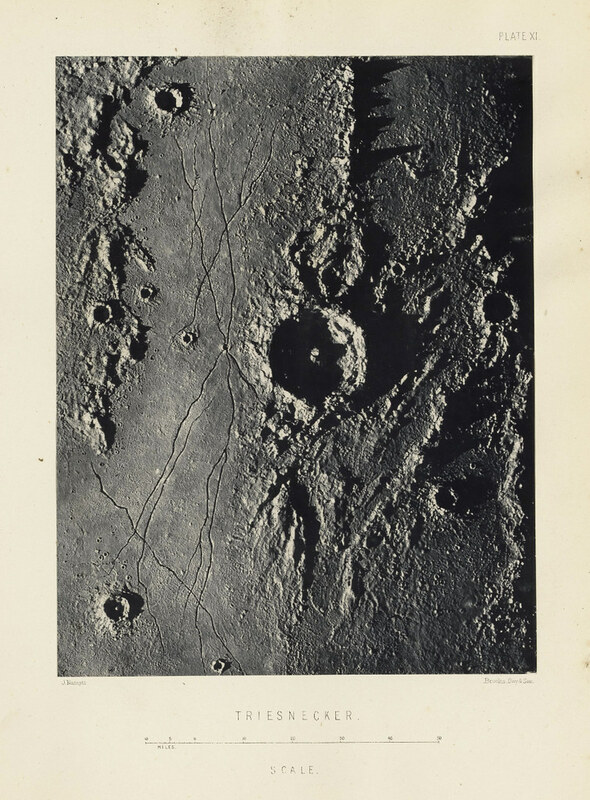 Peering through a self-made telescope, James Nasmyth sketched the moon’s scarred, cratered and mountainous surface. 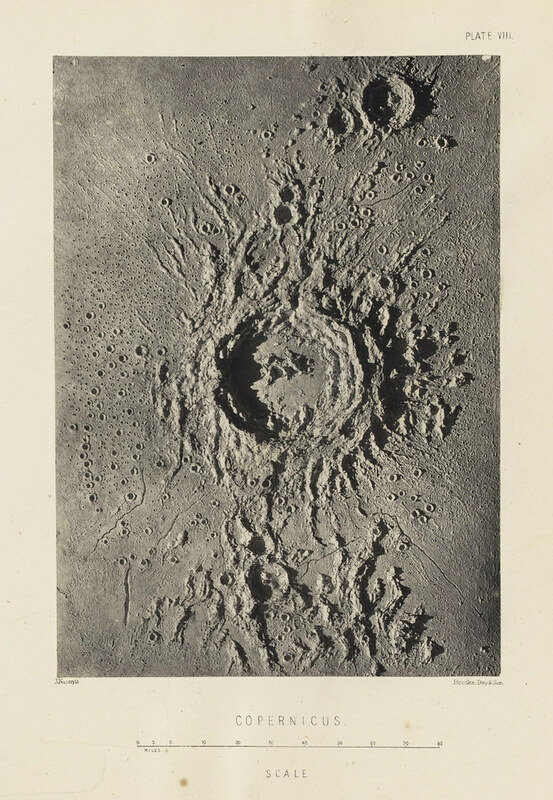 Aiming to “faithfully reproduce the lunar effects of light and shadow” he then built plaster models based on the drawings, and photographed these against black backgrounds in the full glare of the sun. 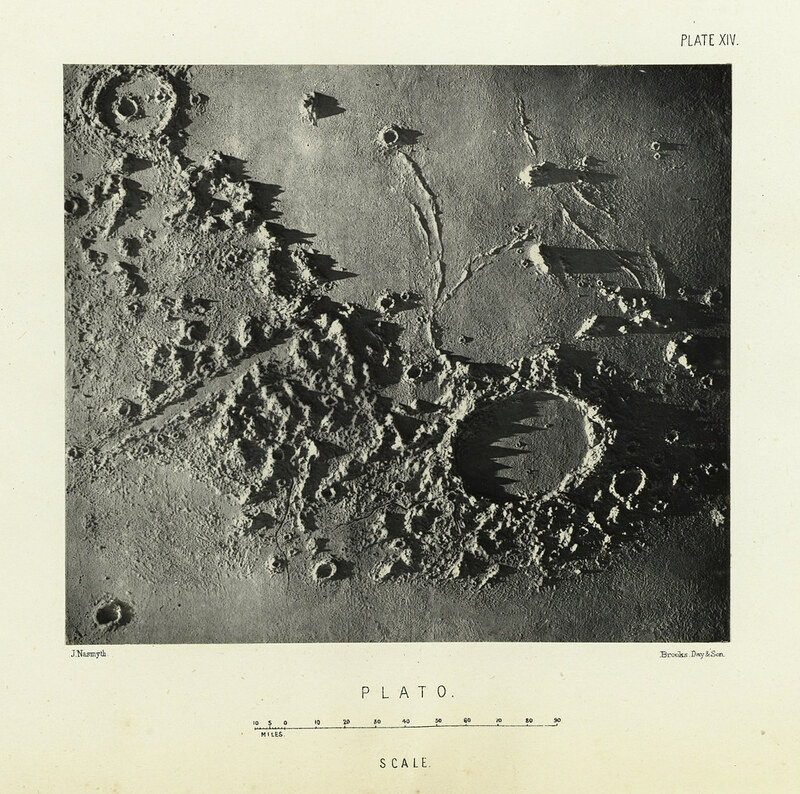 As the technology for taking photographs directly through a telescope was still in its infancy, the drawing and modelling stages of the process were essential for attaining the moonly detail he wanted. Though not a professional astronomer the Edinburgh-born Nasmyth was a leading entrepreneurial engineer of his day. The precocious James had been only nineteen when he managed to build a steam carriage to carry half a dozen people along the roads of his hometown in 1827. As a young man he moved to London for a time before settling in Manchester and dreaming up his most famous invention, the steam hammer. This mighty tool was designed to forge the paddle shaft of the steamship Great Britain then being designed by Brunel. 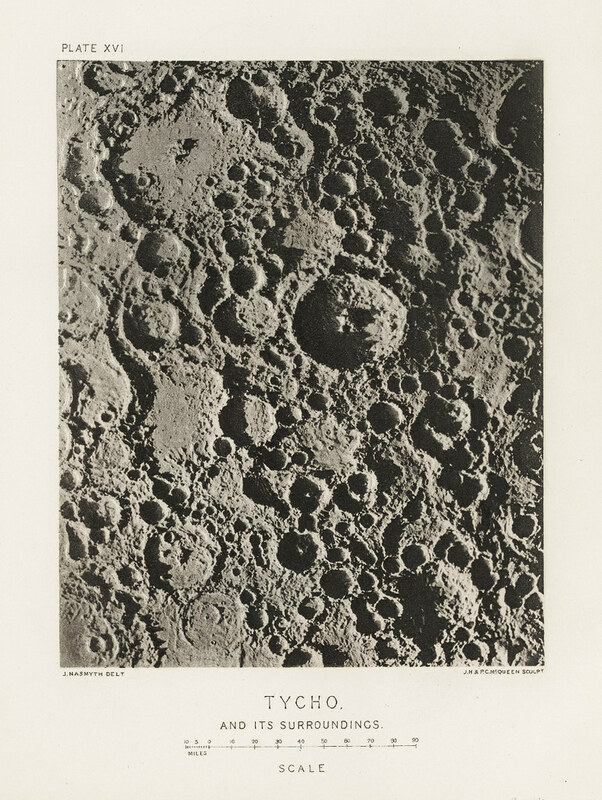 Despite never actually hammering out that particular shaft, the invention went on to be such a commercial success that Nasmyth was able to retire in 1856 and pursue other passions, notably moon-gazing. This was at a time when many important questions about the moon remained open. Did it have an atmosphere? Could it sustain life? How exactly were its myriad features formed? It was this last question that particularly enthused Nasmyth. 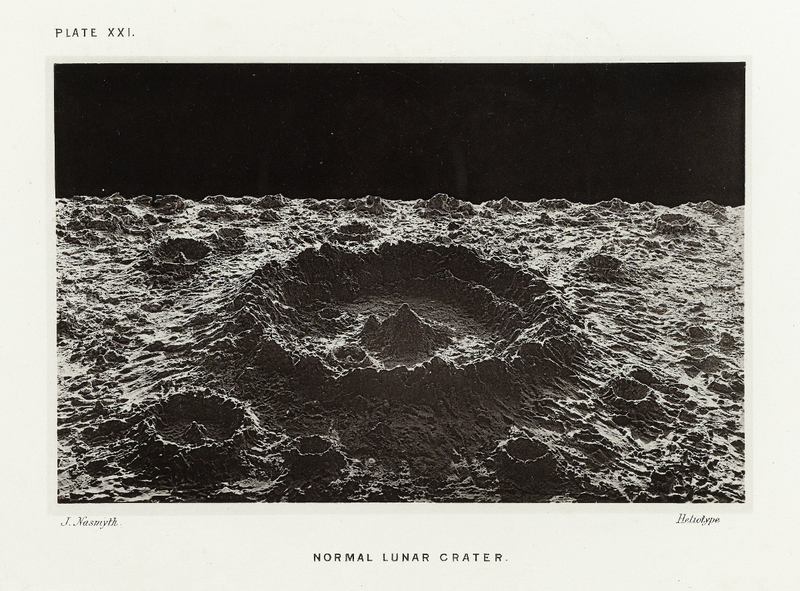 Between 1856 and 1874 he made frequent observations of the moon, mainly through a 20-inch reflector telescope mounted on a special turntable, all designed by himself. 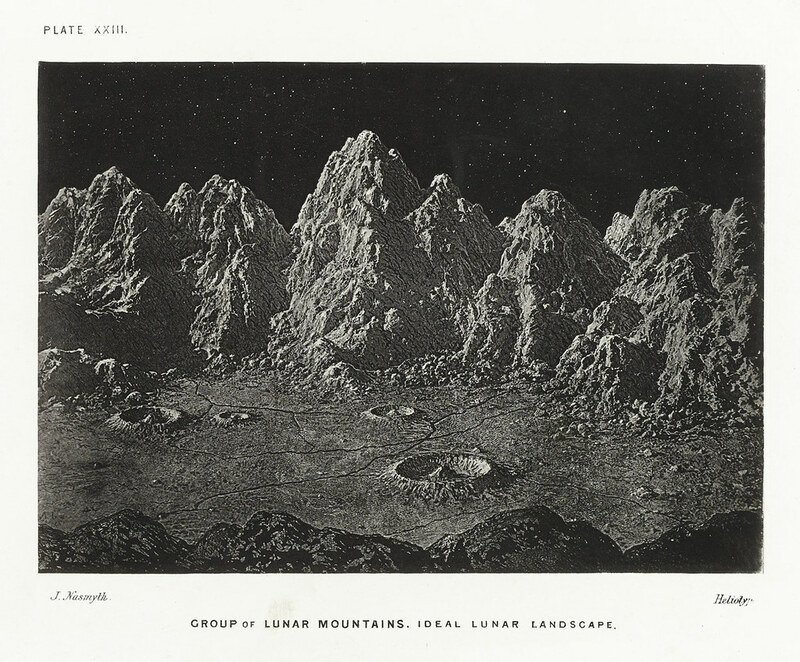 In his book The Moon Considered as a Planet, a World, and a Satellite (1874), co-authored with the astronomer James Carpenter, Nasmyth argued that as the lunar sphere cooled and solidified it also expanded, thus forming its characteristic hollows, mountain ranges, chasms and radiating streaks. 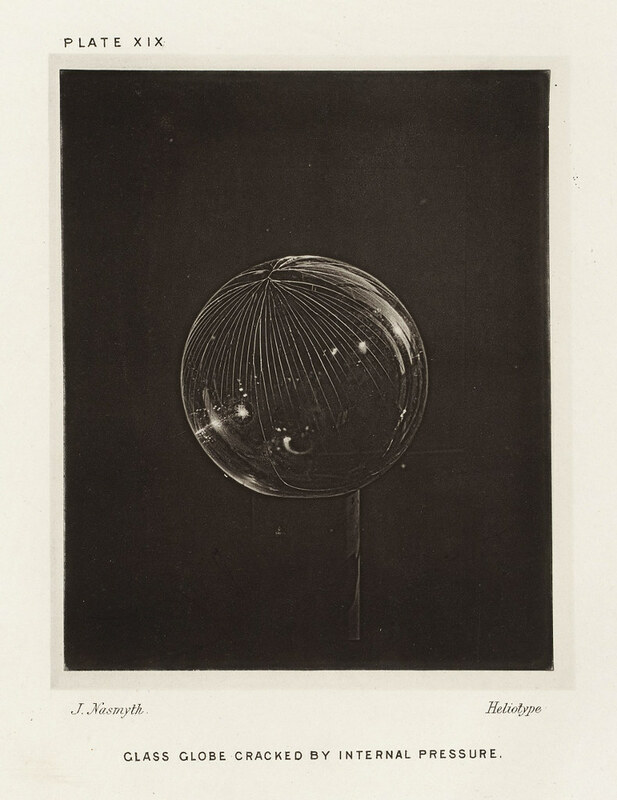 To demonstrate the emergence of the streaks, he provides a photograph of a glass sphere cracked radially by pressure from within. 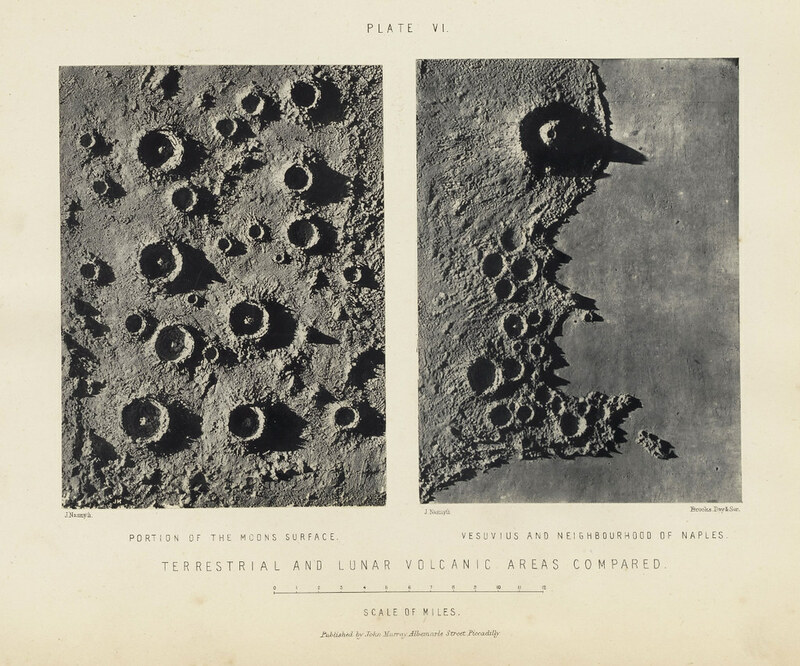 The most striking illustrations though are of the lunar surface itself, or to be precise, of the plaster models Nasmyth built to delineate it. There is something pleasing about the inventor of the gigantic steam hammer absorbed in his little moon models, leaving behind the generation of the extremely powerful in favour of the delightfully delicate. 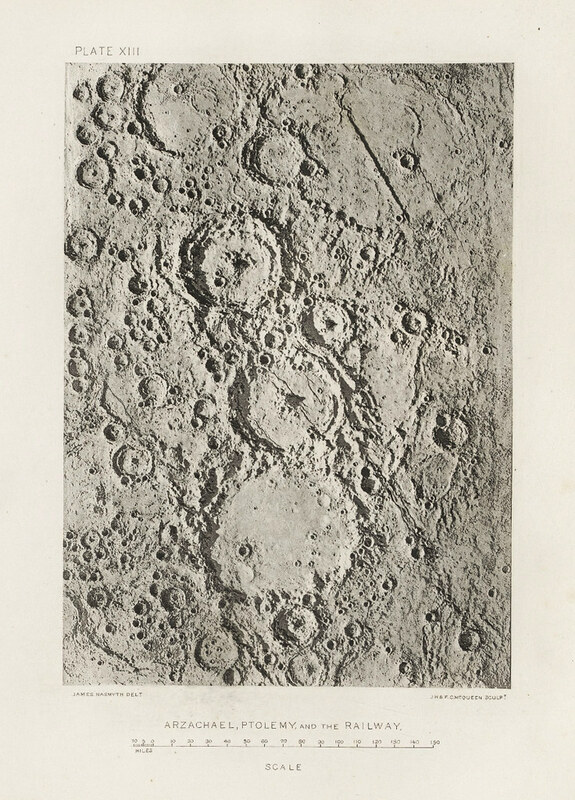 Beyond exploring lunar mechanics and topography, the book can also be seen as an exploration into photomechanical printing (with which it was one of the first books to be illustrated). Published at a time when many were searching for the perfect form of reproduction — a photograph that could be both ink printed (not depending on light) and consistent over time. 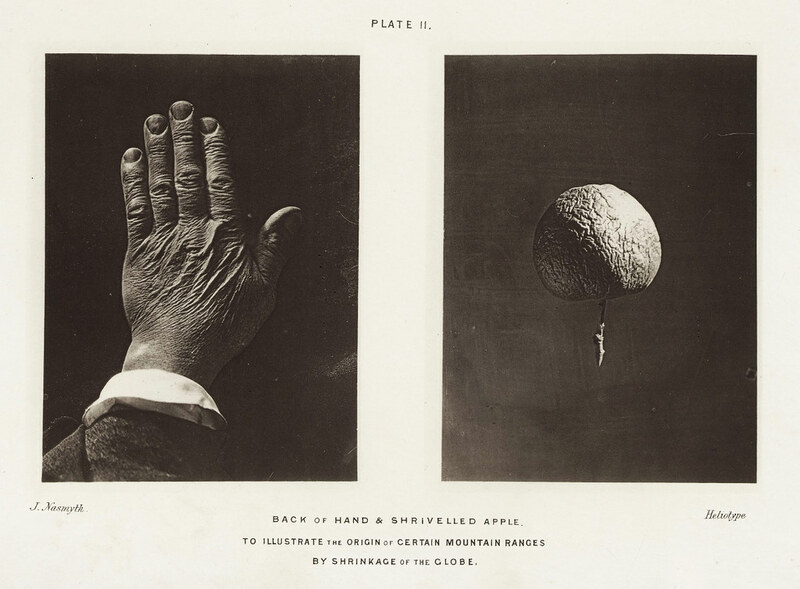 The first three editions of the book include a variety of processes including, engraving, photogravure, heliotype, lithograph, chromolithograph, and four different variations of the woodburytype. It is likely that the first two editions, published simultaneously, were partly experiments into which reproduction method was best. This seems to have been deemed the woodburytype given that the third edition, published more than ten years later, is comprised entirely of woodburytypes. You can read the entirety of the first edition, from which we have reproduced the images below, at the Internet Archive, or buy a 2013 reprint. See the second edition here, and the third edition with the woodburytypes here. 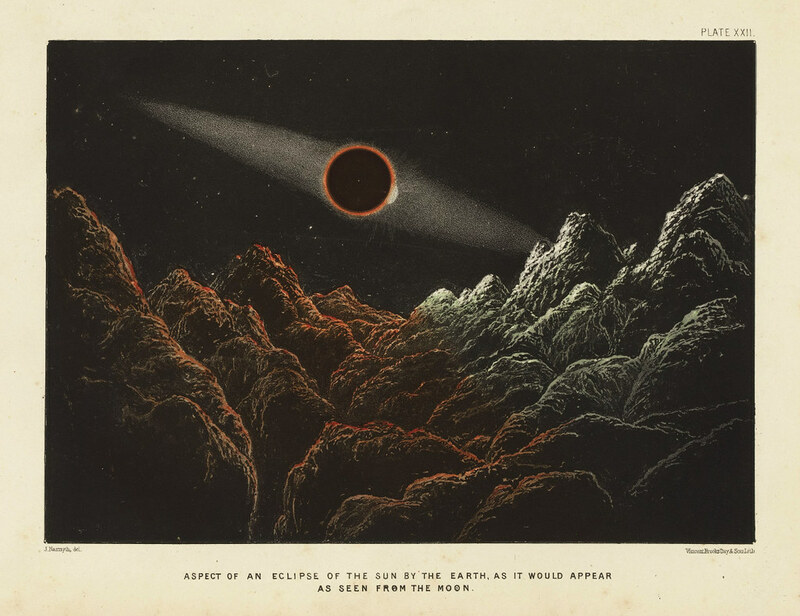 If your curiosity for 1870s lunar representations has been mightily piqued, consider launching yourself into Émile-Antoine Bayard’s wonderful illustrations for Jules Verne’s Around the Moon. 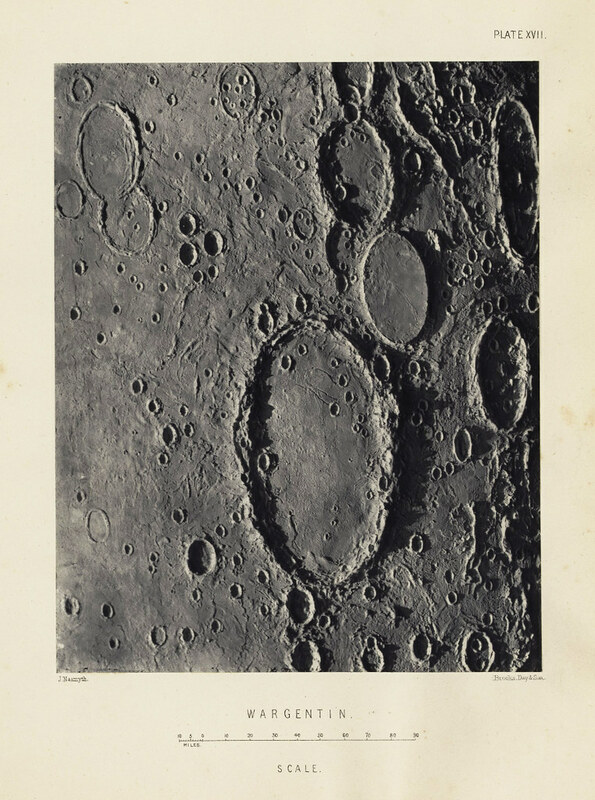 And if you’d like a Nasmyth moon image on your wall then check out these three available in our online prints shop. Finally, an intriguing point for all you conspiracy theorists out there who haven’t yet noticed: the name of this man, who so studiously made convincing models of the lunar surface, is just one letter away from NASAMYTH.